By default, the guide axes that are drawn across your mouse cursor extend throughout your entire drawing space. You may want those axes to only extend to a short distance around your cursor, so that they can still serve as guides without obstructing your drawing space or drawing your eye away from your mouse cursor. You can do this by disabling the Full Cursor Display option, which is enabled by default. The guide axes displaying across your mouse cursor only span on a short distance from your mouse cursor. 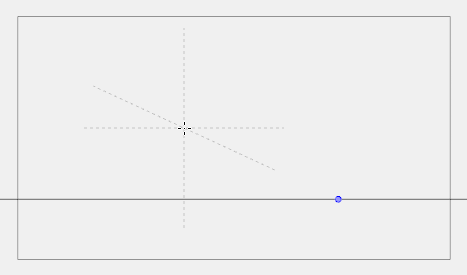 When drawing a stroke, all guide axes disappear until you finish drawing the stroke. By default, only the axis you are drawing on disappears. The actual axes used to lock your drawing tool still extend across the entire drawing space. Only the axes displayed in your drawing space are shortened. In the Guides view, toggle the Full Cursor Display button off. The guide axes now only span over a short distance from your mouse cursor.